A southern classic, Hummingbird Cake delights all who taste it. 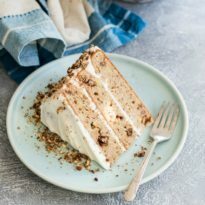 Chock full of sweet tropical fruit and a cream cheese frosting pressed with toasted pecans, you’ll be migrating back to this perfect cake on a regular basis! Preheat the oven to 300 degrees. Spread pecans onto a lined baking pan. Toast for 8 minutes. Remove from the oven. Increase oven heat to 350 degrees, then grease and lightly flour three 9-inch round cake pans. In a medium bowl, whisk together the flour, baking soda, cinnamon, allspice, and salt. In a large bowl, whisk together bananas, pineapple, eggs, oil, brown sugar, white sugar, and vanilla. Add dry ingredients to wet ingredients in 3 batches, stirring to combine after each addition. Fold in 1 1/2 cups toasted pecans (reserve the remaining for garnish). Remove cakes from the oven and set on wire rack to cool completely. Once completely cooled, remove cakes from pans and use a serrated knife to level the tops so they are flat. In a standing mixer with the paddle attachment, or using an electric mixer, beat cream cheese and butter together on high speed until smooth and creamy. Add powdered sugar, vanilla, milk, and salt. Beat on low speed for 30 seconds, then switch to high speed and beat for 2 minutes. Taste. Add more salt if needed. Place 1 cake layer on cake stand or serving plate. Evenly cover the top with frosting. Top with 2nd layer and evenly cover the top with frosting. Finish with the third cake layer and spread the remaining frosting all over the top and sides. Garnish with leftover toasted pecans. Refrigerate for at least 30 minutes before slicing (or else the cake may gently fall apart as you cut). How to Make Hummingbird Cake Cupcakes: For cupcakes, we’d recommend baking for 14 to 18 minutes (or until a tester inserted into the center of one comes out clean). Then let them cool for a few minutes in the cupcake pan before transferring them to a cooling rack. The recipe should make about 24 cupcakes. Pecans may be omitted or substituted with 1 cup sweetened shredded coconut.